Preparing the Neck Block: The block for the neck has been planed to the width of the scroll eyes, and flat on the front. Next, a template of the scroll is nailed to the wood, so that the outline and details of the scroll can be marked on each side. Marking the Neck Block: After the template is in place, the outline is scribed, and holes are punched through the holes in the template to mark the shape of the spiral of the head. Marking the Important Widths: Next, the block is sawn out using the lines just made, the sawn areas are trued up with files and small planes, and the first important widths are marked on the front and back. Then the block is sawn roughly to width, outside the area prepared on the front for the board and up the sides of the pegbox to the bottom of the volute (the spiral on top). Roughing the Volute: After the extra has been sawn off the lower parts of the neck, it's time to start carving the volute. The first turn is crudely sawn out in facets. Next, gouges will be used to somewhat further refine both the first turn of the volute and the pegbox under it. 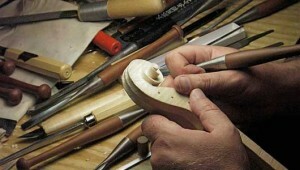 Carving the Rest of the Volute: After the first turn is roughly shaped, the same process is used to finish the second turn as well as the eye. At this stage the whole thing looks quite ragged. Refining the Scroll: Once the basic scroll has taken shape, further refinement is done so that it looks good from every angle. Finishing the Shape of the Scroll: Once the basic lines are perfected, the bevel around the edge is added, followed by the fluting on the front, top, and back. Overall, the shape is still rough. The inside of the pegbox is hollowed out next and then, finally, everything is refined almost to its final form in preparation for attaching the fingerboard.